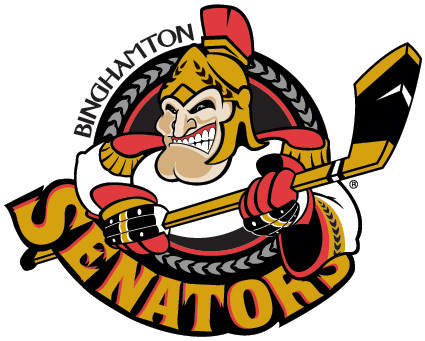 The Binghamton Senators plan to score a major goal for Catholic Charities Emergency Food Program with their ‘Food Drive Fridays’ campaign. Fans attending games on three successive Fridays in January beginning January 10th will be encouraged to bring non-perishable food items to fill food barrels at the Broome County Veterans Memorial Arena. The donations will help feed individuals and families in Broome County that are served by Catholic Charities through the Monsignor Owens Food Pantry in Binghamton and Mother Teresa’s Cupboard in Endicott. Enjoy all the excitement of American Hockey League action as the Senators take on their AHL rival Hershey Bears on January 10, the Bridgeport Sound Tigers on January 17 and the Albany Devils on January 24. All games start at 7:05 PM. Many thanks to the Binghamton Senators for their community spirit. Go Senators!